During the Holocaust, in addition to the genocide perpetrated against the Jews, the Nazis also perpetrated genocide against other groups of people, including the Roma and Sinti (gypsy) people of Europe. The genocide of the gypsies is often referred to as the Porajmos. 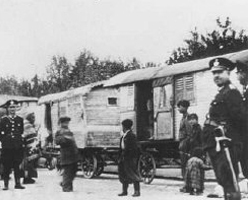 This Mini Quest activity explores the experience of the Roma and Sinti people during the gypsy genocide, which occurred at a number of camps, including Auschwitz-Birkenau. The Auschwitz camp complex, established in 1940, consisted of concentration, extermination, and labor camps. For clarity, in IWitness activities, Auschwitz is used to refer to the main camp; Auschwitz-Birkenau or Birkenau refers to the extermination center; and Auschwitz-Monowitz or Monowitz refers to the labor camp.